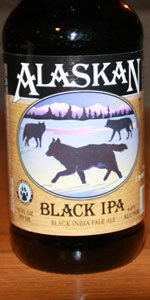 Alaskan Black IPA | Alaskan Brewing Co. Poured from a 12-oz. bottle into a pint glass at my house on Aug. 6, 2012 (picked it up for $9.49 for a six-pack at Village Square Liquor & Kegs in Grantville (San Diego, Calif.) on Aug. 6, 2012). Two-to-three fingers of tan head, a bit like khaki pants, that settles to a full layer of espresso on the top. Lace stays strong and balanced on the top and sporadic and foamy on the sides. Good variety of smells on the nose. Got dark roasty malts first, maybe even some nuts. Small whiffs of coffee beans. Then comes plenty of hops, but not sure it was citrus. Smells good though. The best part of the beer, but I couldn’t quite pull the trigger on a 4.5 rating. Taste was initially a bit disappointing after the smell, but wasn’t so bad after all. Got bitter hops in the beginning, fiving way to the roasty dark malts that I smelled earlier. Kind of a weak watery finish. Deceivingly medium-to-light body. Thin oily texture. Average carbonation. Abrupt, bitter finish. Seemed to warm quickly. I’d say this was more of your average Black IPA, but I would have it again. That could be because I seem to love Black IPA’s, but still. Much better for me than the regular Alaskan IPA. A- Dark, opaque black pour with a little cream colored, bubbly head. Lots of lacing stuck to the glass. Small glimmer of ruby around the edges when held to the light. The head dissipates into a little cap that sits on the brew. Looks like a solid Cascadian Dark Ale (to each his own). S- Herbal, piney hops and milk chocolate. Perhaps a little wood and citrus. Smells really nice. Pretty standard aromas here for a black ipa but they meld together really well. T- Very good flavor. Lots of herbal hops off the top followed by a subtle chocolate, coffee note in the middle. The finish is light citrus hops. Fairly sweet for a CDA/BIPA with moderate bitterness. Very drinkable and delicious. M- Creamy, medium weight body with less carbonation than expected. Solid mouthfeel. Sort of fails to stand on its own, though. O- This is a nice Cascadian Dark/Black IPA. It doesn't overdo the roasted malts like some tend to. The piney, citrusy hops should shine in this style. Its not a hoppy porter. Alaskan kept this in mind when brewing this ale and turned out a sessionable, delicious beer. Not overly flavorful but a nice drinker. Pours a deep coffee hue with bits of burgundy. Finger of mocha head and very average lacing. On the nose I get some nuts, subtle chocolate, toasted grains, hops are pretty understated. The hops take on a stronger character on the tongue but lack direction - they fade into abstract bitterness before taking on much shape. The dark malts are nice though. I could be fooled into thinking that there’s a bit of coffee in this one. A decent brew. must be a newer one from these guys, only the tenth review... pours a nice brown ale/porter color with a 2 inch white head of tiny bubbles. smells less like an ipa and more like a black lager or something. tons of roast in the aroma, not as much hops as may beers in this genre. flavor too, plenty hoppy, but its not dominant. balanced by dark malt and a fairly light mouthfeel for the style. very approachable and drinkable, much more of a hoppy porter or something than a black ipa as i traditionally think of them as the hops just isnt the main focus for me. solid brew. 12oz bottle poured into a pint glass. A: Very dark brown. A little light gets through giving a reddish brown glow. One and a half finger light tan head with good retention and lacing. S: Floral and citrus hops. Dark malts, faint chocolate, very faint roast. Overall a light aroma. T: Light chocolate and nuttiness upfront. Floral hops, faint bitterness. Finishes with a touch of citrus hops. M: Medium light body. Medium carbonation. Slightly creamy. Faintly dry. O: It's a decent beer. Black IPA's, IMO, are hard to pull off. This sort of works. Easy drinking. This is not a beer to drink with mozzarella cheese, salami, and sun dried tomatoes. What was I thinking? It is a beer to drink on a cool spring day, though. Isn't it funny how 40 degrees seems warmer in the spring than in the fall? Exactly why Alaskan's Black IPA is a perfect early spring beer. For me, it's a bit too powerful (read: hoppy) for hot summer days, which in Alaska means a scorching 70 degrees. Thank God we've got another two months or more before we hit that! It's beautiful black pour and hoppy aroma says IPA. The crisp bitterness is complimented well by the dark malt's burnt English toffee flavor. While some may say the Black IPAs are gimmicky, I'll argue they're a refreshing and clever mix of flavors, distinctive and unique. As for the Alaskan version of this IPA-and-dark-beer-lover's treat, it gets a B. Where it has two great distinct flavors that mix well together, it lacks complexity beyond that. It's deepest flavor disappears all too quickly, leaving nothing but the hops to rest on the tounge. Pours a dark amber/brown with a tanned head. Leaves some decent lacing. Nice little roasted malt lending a coffee quality and some chocolate. Citrusy orange/grapefruit/pine hop aroma. Decent lingering bitterness with a well balanced flavor profile of roasted coffee and grapefruit. Medium mouthfeel. This is a very delicious well rounded brew. A session ipa. I like the darker malt quality of it. Poured from bottle, undated, to pint glass. The beer is a very solid black/brown color with a creamy 1 finger tan head with pleasant retention and lacing. The nose presents a good mix of citrusy hops and chocolately malt character. Hop forward but not over the top, quite nice. The flavor consists of very much the same powdery cocoa with mild bitterness and a good amount of citrus hop character. Mild toasty malt presence. Well balanced. Medium bodied with a mouthfeel of soft creaminess. Finishes with a slight chalky texture but is relatively smooth. Very drinkable. I really enjoyed this beer, excellent representation of the style. Look forward to the next! T - The creamy/roasty malts blend nicely with the pine hop flavors. Finishes with a light bitterness that leaves be suprised but is also dry and crisp. M - Light to Medium bodied with light carbonation and again a nice drying effect. O - Not my favorite IBA so far but still good. I prefer this style to have loud hop presence with quite and gentle chocolate flavors. It just seemed a little to balanced for my liking. Alaskan Black IPA from Alaskan Brewing Co.